Your gold map CD contains all the documents and files needed to begin your search for gold claim locations. 1. Insert the CD into your computer disc drive. 3. (optional) If CD files end in .zip, unzip the main files (using Winzip, 7zip or any .zip unzipping software). 5. Open Google Earth™. Click “File” from the top menu. Click “Open” and locate the map files copied from the disc (from Step 2). Double click or select multiple map files and click “Open”. NOTE: Some of the State files are very large, so they might take a moment to load. 7. Click on any claim location to view details. 8. Need More Help? Visit USGoldMaps.com for video tutorials and contact info. This video tutorial covers how to use the Active & Abandoned Claims Map and USGM Quad-View™ US Gold Maps™. This video tutorial covers how to search for claims by claim name. Garmin BaseCamp™ Legend for Active & Abandoned Claims Maps & USGM Quad-View™ Gold Maps. 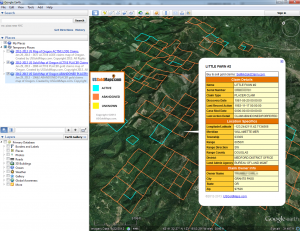 Your gold map CD contains all the documents and files needed to begin your search for gold claim (Active & Abandoned Claims Map) and/or Federally registered (USGM Quad-View™ Maps) gold site locations. 5. Open Garmin BaseCamp™. Select the folder you would like to import the map into e.g. My Collection. Click “File” from the top menu. Click “Import into My Collection” (My Collection could be any folder name you selected for the import) and locate the map files copied from the disc (from Step 2). Double click or select multiple map files and click “Open”. 7. Click on any claim location to view details. Click on “Notes” to view additional details about the location.